In this sample we will create a basic data source connector for Microsoft Graph. It is written as a walk-through that you can follow step by step. To access Graph, you will first need to register your own Azure Active Directory client application. If you do not have an application ID already, you can create one through the Getting Started with Microsoft Graph site. Click the "Universal Windows" option, and then the "Let's go" button. Follow the steps and receive an App ID. As described in the steps below, use https://oauth.powerbi.com/views/oauthredirect.html as your redirect URI when registering your app. Client ID value, use it to replace the existing value in the client_id file in the code sample. We will use Power Query (via Power BI Desktop) to write the M for the Graph OAuth flow. You'll also want to download and install Fiddler to help trace the raw HTTP requests you make while developing the extension. 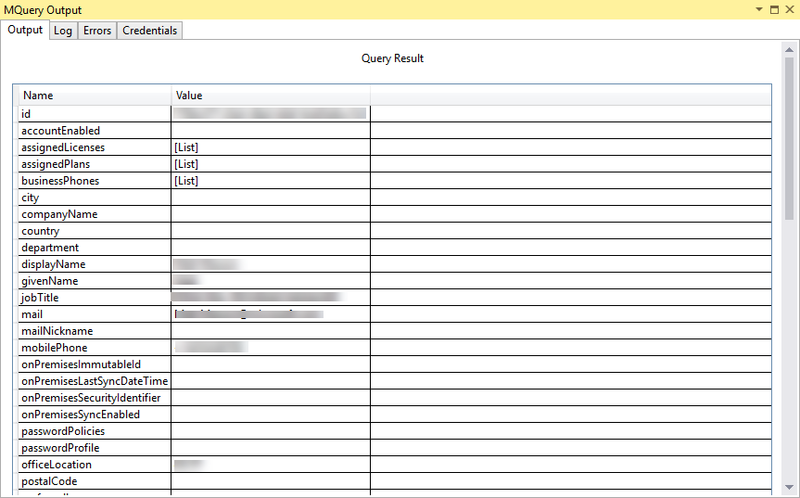 To get started create a new blank query in Power BI Desktop, and bring up the advanced query editor. 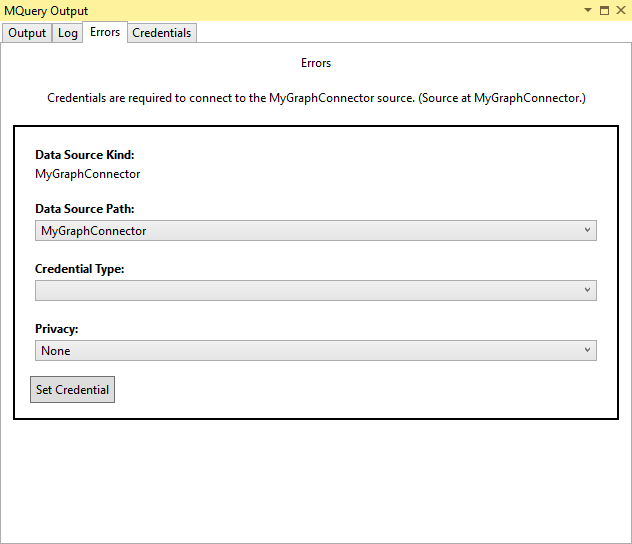 Set the client_id with the app id you received when you registered your Graph application. Graph has an extensive list of permission scopes that your application can request. For this sample, the app will request all scopes that do not require admin consent. We will define two more variables – a list of the scopes we want, and the prefix string that graph uses. We'll also add a couple of helper functions to convert the scope list into the expected format. You will need to set several query string parameters as part of the authorization URL. We can use the Uri.BuildQueryString function to properly encode the parameter names and values. Construct the URL by concatenating the authorize_uri variable and query string parameters. The full code sample is below. Close the Advanced Query Editor to see the generated authorization URL. Launch Fiddler and copy and paste the URL into the browser of your choice. Entering the URL should bring up the standard Azure Active Directory login page. Complete the auth flow using your regular credentials, and then look at the fiddler trace. You'll be interested in the lines with a status of 302 and a host value of login.microsoftonline.com. Click on the request to /login.srf and view the Headers of the Response. Under Transport, you will find a location header with the redirect_uri value you specified in your code, and a query string containing a very long code value. Extract the code value only, and paste it into your M query as a new variable. Note, the header value will also contain a &session_state=xxxx query string value at the end – remove this part from the code. Also, be sure to include double quotes around the value after you paste it into the advanced query editor. When you return the jsonResponse, Power Query will likely prompt you for credentials. Choose Anonymous, and click OK. If you check the fiddler trace you will see a more detailed error message in the JSON body of the response related to timeout. Later in this sample we'll update our code so that end users will be able to see the detailed error messages instead of the generic 400 Bad Request error. Try the authentication process again (you will likely want your browser to be In Private mode to avoid any stored auth info). Capture the Location header, and update your M query with the new code value. Run the query again, and you should see a parsed record containing an access_token value. Run your query again and you will receive an error (because your code was already exchanged for an auth token). This time you should see the full detailed error message from the service, rather than a generic 400 status code. Take a copy of the code contained within this sample, and open the MyGraph.mproj project file in Visual Studio. 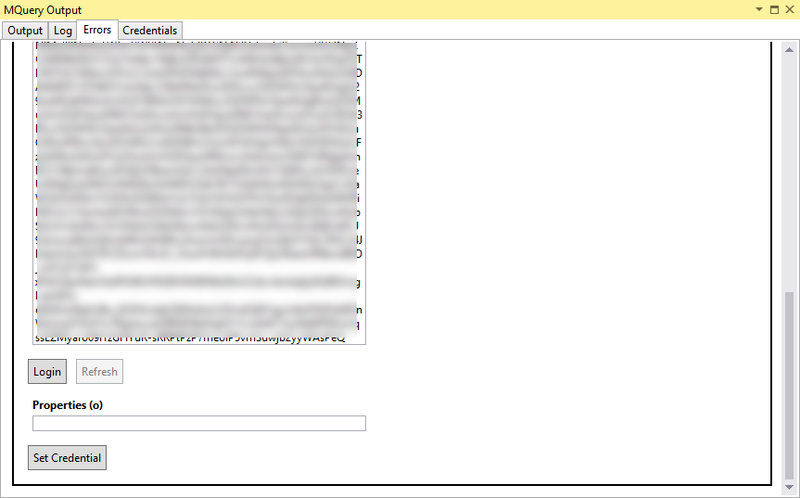 Update the client_id file with the AAD client_id you received when you registered your own app. You'll likely notice that the code is very similar to the OAuth sample code above, with some key differences that will be described below. There are also slight formatting differences due to the code being within a section document (rather than query expression). Another difference is the MyGraph.Feed function. This will be the data source function we'll expose to the engine. We'll be adding our logic to access and read Graph data in here. We've associated the function with the MyGraph Data Source Kind, and exposed it in the UI using the MyGraph.UI record ([DataSource.Kind="MyGraph", Publish="MyGraph.UI"]). Since our data source function has no required arguments, it acts as a Singleton data source credential type. This means that a user will have a single credential for the data source, and that the credential is not dependent on any of the parameters supplied to the function. We've declared that OAuth as one of our supported credential types and provided function names for the OAuth interface functions. 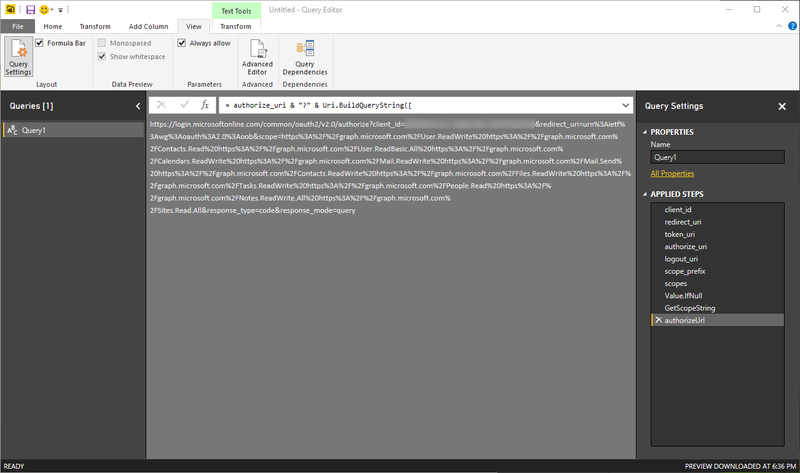 Label = "My Graph Connector"
It is expected to return a record with all the fields that Power BI will need to initiate an OAuth flow. Since our data source function has no required parameters, we won't be making use of the resourceUrl value. If our data source function required a user supply URL or sub-domain name, then this is where it would be passed to us. The State parameter includes a blob of state information that we're expected to include in the URL. We will not need to use the display value at all. The body of the function will look a lot like the authorizeUrl variable you created earlier in this sample – the main difference will be the inclusion of the state parameter (which is used to prevent replay attacks). The context parameter will contain any value set in the Context field of the record returned by StartLogin. Typically this will be a tenant ID or other identifier that was extracted from the original resource URL. The callbackUri parameter contains the redirect value in the Location header, which we'll parse to extract the code value. The third parameter (state) can be used to round-trip state information to the service – we won't need to use it for AAD. We will use the Uri.Parts function to break apart the callbackUri value. For the AAD auth flow, all we'll care about is the code parameter in the query string. If the response doesn't contain error fields, we pass the code query string parameter from the Location header to the TokenMethod function. The TokenMethod function converts the code to an access_token. It is not a direct part of the OAuth interface, but it provides all the heavy lifting for the FinishLogin and Refresh functions. Its implementation is essentially the tokenResponse logic we created earlier with one small addition – we'll use a grantType variable rather than hardcoding the value to "authorization_code". This function is called when the access_token expires – Power Query will use the refresh_token to retrieve a new access_token. The implementation here is just a call to TokenMethod, passing in the refresh token value rather than the code. The last function we need to implement is Logout. The logout implementation for AAD is very simple – we just return a fixed URL. MyGraph.Feed contains your actual data source function logic. Since Graph is an OData v4 service, we can leverage the built-in OData.Feed function to do all the hard work for us (including query folding and generating a navigation table!). Once your function is updated, make sure there are no syntax errors in your code (look for red squiggles). Also be sure to update your client_id file with your own AAD app ID. If there are no errors, open the MyGraph.query.m file. The <project>.query.m file lets you test out your extension. You (currently) don’t get the same navigation table / query building experience you get in Power BI Desktop, but does provide a quick way to test out your code. Click the Start (Debug) button to execute the query. Since this is the first time you are accessing your new data source, you will receive a credential prompt. Select OAuth2 from the Credential Type drop down, and click Login. This will popup your OAuth flow. After completing your flow, you should see a large blob (your token). Click the Set Credential button at the bottom of the dialog, and close the MQuery Output window. Run the query again. This time you should get a spinning progress dialog, and a query result window. You can now build your project in Visual Studio to create a compiled extension file, and deploy it to your Custom Connectors directory. Your new data source should now appear in the Get Data dialog the next time you launch Power BI Desktop.